Due to the ubiquitous presence and use of animals in our society, animal law overlaps with many areas of law. 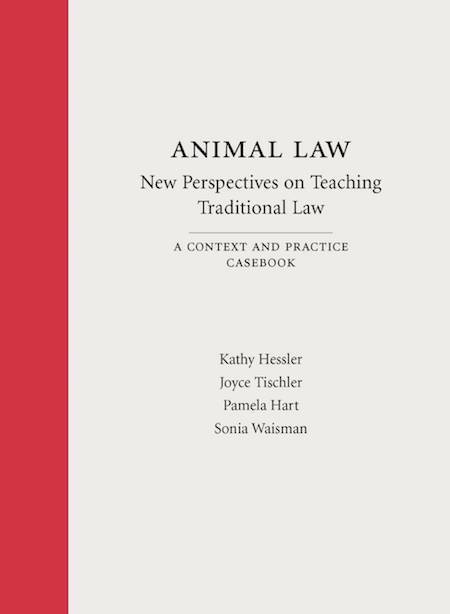 A Context and Practice Casebook by Kathy Hessler, Joyce Tischler, Pamela Hart, Sonia Waisman - Carolina Academic Press. For law professors looking for new tools to help explain core legal concepts, this book provides a fresh perspective on teaching such courses as Property, Contracts, Torts, Constitutional Law, Criminal Law, Remedies, Environmental Law and Wills & Trusts. Due to the ubiquitous presence and use of animals in our society, animal law overlaps with these and other areas of law. The lessons we learn from these intersecting spheres of law are important and can help us reframe our understanding of individual substantive areas. For example, a person who owns a domesticated mouse cannot legally poison or cruelly kill the mouse, whereas it is standard practice — and legal — to trap, kill, or poison mice who come into our homes and are considered pests. If the behavior is the same, and the legal consequence is different, one may question whether the contextual differences support that outcome. Moreover, animals are legally classified as property. However, scientifically, animals are classified as living beings with certain capacities. While the law generally fails to explicitly distinguish between living beings (non-human animals) and inanimate objects, the dissonance between the scientific and legal realities creates anomalies within the law, which are surfacing with increasing frequency. The property classification of animals, in particular, results in inconsistent legal outcomes. Analyzing animal law cases within traditional areas of law encourages critical thinking and questioning of the func­tion of certain legal constructs, sharpens our legal analysis and tests the law’s ability to respond to changing realities. Individual topics are available as ebooks. Each individual subject area ebook begins with the front matter for the entire book, including the "General Overview." This book is available at Carolina Academic Press. Including animal law cases creates a fresh lens through which to explore core constitutional law concepts, such as standing. For example, students can be asked to examine how and what sort of plaintiff would be able to allege standing to sue when the victim of an injury is a factory farmed, research or zoo animal, providing students with an opportunity to think creatively about the application and development of key constitutional law principles in a context that is increasingly relevant in our society, but which may be new to many students. Studying cases that involve sentient living beings enables students to think more deeply about the role of contracts in American society. Issues raised by animal law cases include: whether the legal system adequately addresses the interests of animals in contracts in which they are the subject matter; and, whether, in a contract dispute, the animal(s) can or should be considered an “interested party.” More specifically, this chapter includes issues relating to leases, condominium bylaws and custody disputes, to name a few, where companion animals are at the heart of the dispute (both literally and figuratively). Incorporating animal law cases within a criminal law course will help students understand how the law develops in response to new information and evolving social consensus about what constitutes cruelty and which species are protected. In the past three decades, criminal anti-cruelty laws have been strengthened in all fifty states. Students will learn how this plays out in prosecutions, convictions and sentencing. As just one example, students will be exposed to the sorts of questions prosecutors and judges have to consider concerning the pre-trial forfeiture of evidence when that evidence is a live animal who cannot be humanely “stored” in an evidence room. Bringing animal law concepts into an environmental law class allows students to address structural change to legal principles in an explicit and rigorous manner. One example addresses concentrated animal feeding operations (CAFOs), which not only confine animals in substandard conditions, but also have deleterious effects on the environment (air, water and soil). Students will also learn about the Endangered Species Act and many other federal laws that impact individual animals as well as species. Animal Law poses a fundamental question: How is the legal analysis of property law affected when the interests of sentient (but non-human) beings are considered? Because our legal system treats animals as property in some cases, and as quasi-property beings in other cases, judges and legislatures are creating new rules to balance existing law with a growing recognition of the special character of living forms of property. This chapter also considers the core question of whether animals should be removed from the property status. Reviewing animal law cases will encourage students to think critically and question the function of certain legal constructs that, in many respects, have not been rigorously challenged for more than a century. American society is undergoing a significant change in the treatment of animals, particularly the animals who live with human beings and are increasingly considered to be family members. Adding animal law concepts to a torts course engages students in analyzing how the legal system responds to changing societal values, and allows them to more clearly see bridges between legal fields. In particular, the valuation and measure of damages in tort cases, where the injured or killed victim is a beloved companion animal, is the focus in a growing number of cases throughout the country, as is the question of which tort causes of actions may be available to plaintiffs in this circumstance. Tort law involving animals, especially in cases of harm to companion animals, offers students a firsthand look at how courts approach their role in keeping the common law up-to-date with changing societal views and their rationales for doing so, or for holding firm to past precedents and deferring to state legislatures for such change. While this balancing may come up in various contexts within tort law, it is especially central to tort cases involving harms done to animals. Practitioners of wills, trusts and probate law increasingly encounter animal owners who wish to provide for the care of their animals at their incapacity or death. Adding animal law cases to the course syllabus offers a fresh and engaging way for students to approach core legal concepts, as well as the opportunity to think creatively about the application and development of estate planning and probate law. For example, students might have to grapple with a case in which the testator tried to create an estate plan to provide lifetime care for her five beloved dogs, but family members challenged her will in order to gain access to the residue, without having to wait for the last dog to die of natural causes; or cases where courts have to determine whether to interject their own view of what constitutes a reasonable amount of money to leave for the care of the decedent’s companion animals, even if it conflicts with the testator’s expressed intent.